Grimas Blood has a light and syrupy texture and a deep red colour. It is used for finishing 'wounds' and can be applied directly onto the skin. Blood is available in a handy squeezable small 8 ml tube. Click 'Colours, Sizes, Ingredients' for the list of ingredients used. Ingredients: See label and composition. Toxicology: Assessed against the Cosmetics Regulation (1223/2009/EC). Improper use: Assessed according to the standard of consuming regularly the content of the largest package size ( 8 ml ) . Bacteriology: Contains less than 50 CFUs/g of bacteria, yeasts and moulds. Pathogens: not present. Work hygienically: with clean hands and clean materials. Use on children: Can be used for children. Around the eyes: May be used near the eyes. Not in the eyes. On the mucous membranes: May be used on the mucous membranes. Make-up in the eyes: Rinse with water. Storage: Store in a dry, dark place. 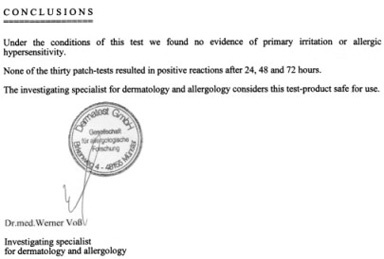 The products have been dermatologically tested for 24, 48 and 72 hours on 30 persons with healthy skin. No irritation occurred. The toxicity profile of the ingredients used, taking account of any contaminants present. Interactions between the various raw materials. Quantities of weight and volume the consumer is exposed to. Foreseeable improper use by the consumer-group. You can apply it directly from the tube or with a brush. Use a Grimas Stoppel Sponge or a tissue to disperse the blood around the 'wound', if desired. The blood can be removed from the skin with cold water initially and then with water and soap. If Blood, Filmblood or Blood Paste got onto clothing, rinse it out under a tap. Leave the item of clothing to soak in water containing a pre-wash (Biotex). Then wash it by hand or put it in the washing machine. The Dutch and English texts have been authorized by Grimas B.V.